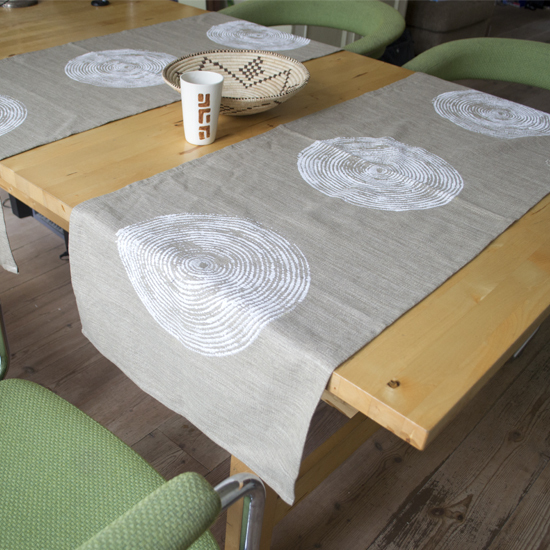 Cloth sewn table runner with basket motif print, designed by the Penduka artists. Available in natural beige and mid blue, basket print in off-white. Size 50cm x 150cm. Cloth sewn table runner with basket motif print, designed by the Penduka artists from the slums of Katutura district, Windhoek. The basket print is made with an authentic Namibia basket which leaves its interesting and delicate texture on the cloth. Available in natural beige and mid blue, basket print in off-white. Size 50cm x 150cm. 100% cotton, machine-washable. For other specific colour/ size variants or personalised motifs please contact us.